In January of 1851, a quintet of masons met on the newly added second floor of a 20′ by 40′ log and frame merchandise store in the village of Waco. 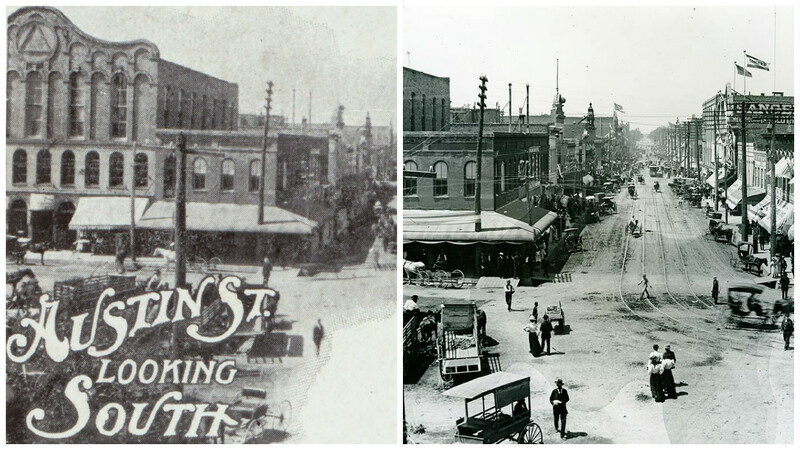 At that time, the village had only existed for two years and Waco was still very much a quintessential “wild west” town. The meeting was called for the purpose of organizing a new masonic lodge for the fledgling community. They drafted a letter of request to establish the new lodge, Bosque Lodge #92, and sent it to Springfield Lodge #74 in Springfield which was the county seat of Limestone County at the time. It was about fifty miles east of Waco where Fort Parker State Park is now. On February 11, 1851, Springfield agreed to accept the request and forwarded the information to the Grand Lodge of Texas in Houston. Bosque Lodge began meeting as a lodge at the Walker & Toole store immediately, under dispensation. Brothers Walker and Toole also provided the necessary furniture for the lodge room and Brother Barnard purchased a set of masonic jewels for the officers from Eleazer Ayers’ Jewelry in New York. One can imagine Barnard made the purchase after reading an advertisement like the one to the right. Though the Grand Lodge granted a charter to our lodge on August 1, 1851, there was an explicable delay so we continued meeting under dispensation until January 23, 1852 when we finally received our charter, signed the previous August by Grand Master W. Ochiltree and Grand Secretary A.J. Ruthven(read about our thirty charter members here). Just three years later, under the leadership of newly arrived Joseph Speight, we changed our name to Waco Lodge and kept our number. 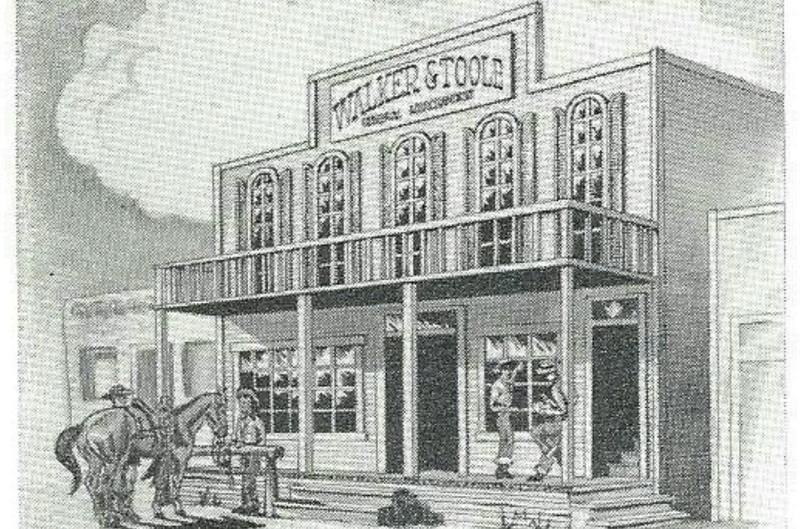 Our meeting place remained in the second floor of the Walker & Toole store. It was said to have been the only two-story building in Waco for a few years. Though we were a new lodge, our members quickly set about working in the quarries. We created the Waco Masonic Institute in 1855, a co-ed institution that evolved over the years and now has the name Texas Christian University and is located in Fort Worth. We also led the Waco community in a number of other ways. Indeed, a great deal of work was done in top of the old store during our first few years. By 1856, our needs outgrew our first meeting place. 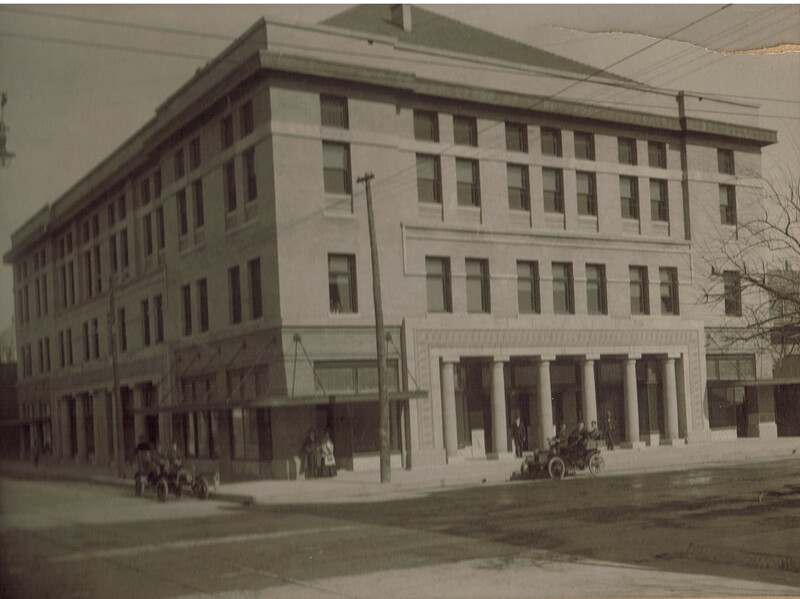 Brother W.W. Downs offered the second floor of his building on the south side of the growing downtown Square and we moved into it for a rental fee of $100 per year. A year later, Brother Downs built the first three-story structure in Waco next door and we moved into the third floor of it. This was the first one known as the Downs Building. The address for the Downs Building was 105 1/2 South 3rd Street, with only the small building we used in 1856 between us and Austin Avenue. Our rental costs rose to $300 per year during the 1860s but in 1870, the lodge purchased ownership of the third floor of the building from Brother Downs. The photo of the Downs Building, above, was taken from the northwest side of the Square looking south. 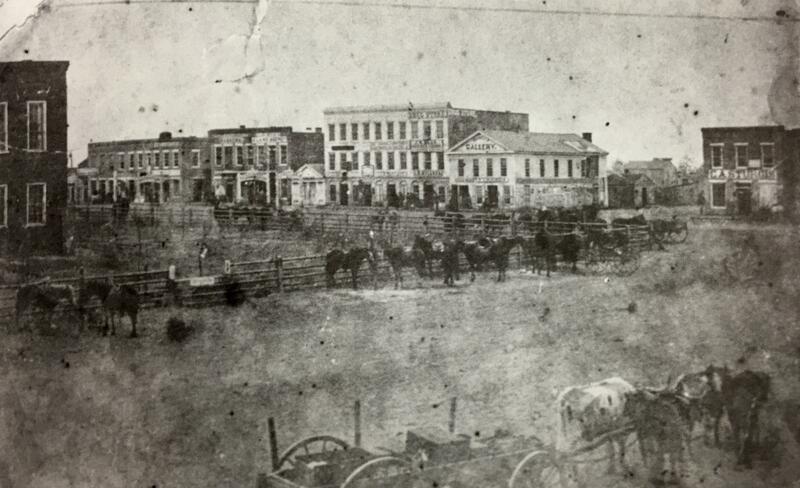 On the extreme left is the edge of the county courthouse built in 1856. One can see that the townspeople would ride into town and tie off their horses along the Square before going about their business nearby. Many things took up the space on the first and second floors of the Downs Building through the years. A fine jeweler, lawyers, land surveyors, general merchandise stores, and more took turns renting out spaces. The primary commonality was that all of them were members of the lodge. 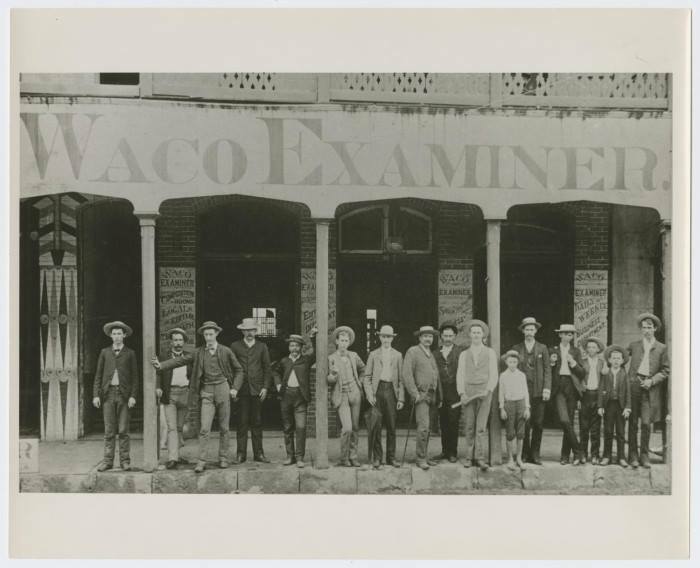 In 1865, Brother Downs began to publish the Waco Examiner newspaper and the photo below was taken of him and his employees standing in front of the first floor of the building. 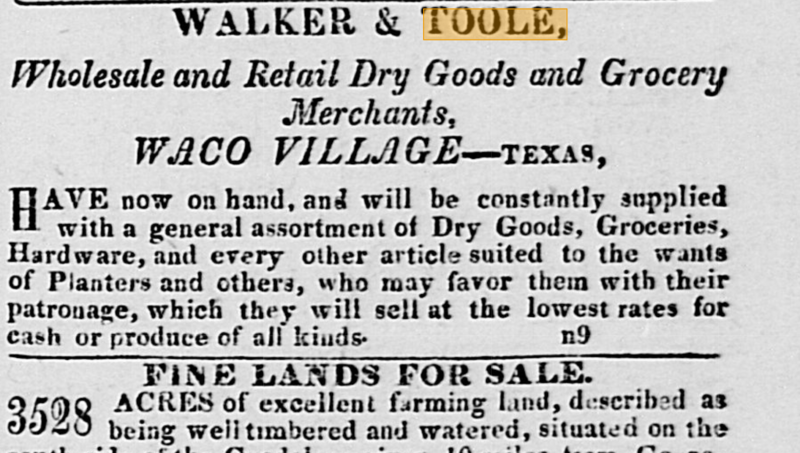 By 1870, Waco was a fast-growing city. It was no mistake that Waco Masonic Lodge was right at the heart of everything as all the shakers and movers were active members. With the new growth came an increased need for easier access across the Brazos so several members of the lodge formed the Waco Bridge Company and financed the Suspension Bridge. Our past master Sion Trice built it. Again, there was no mistake about the placement of the marvelous new bridge in relation to our lodge’s location. 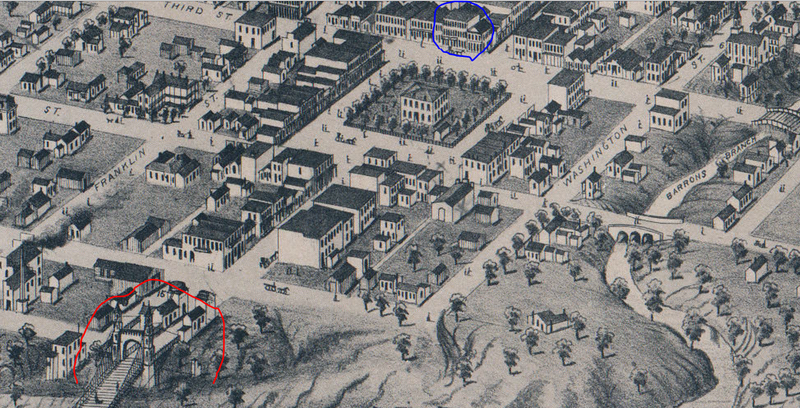 In the photo below, you see the Downs Building circled in blue and the three-year old Suspension Bridge circle in red. As it was, brother masons were able to stand at the window of our lodge room and peer out towards the northeast beyond the modest county courthouse(later replaced by City Hall) and down Bridge Street. In this way, our members could watch all the new settlers and businessmen and outlaws and cattle-drivers coming across the Suspension Bridge. On November 9, 1872, the lodge purchased more property. It was five acres next to and expanding First Street Cemetery for the purpose of providing membership with burial plots(we maintained our rights there for a century until Past Master Roger Conger arranged to have us transfer it so that the Texas Ranger Hall of Fame and Museum could be erected). In 1873, the lodge paid to have a portrait of J.H. Gurley painted and Brothers George Barnard and James Davis donated paintings of themselves. The next March, a painting by artist J.J. Mullins showing Past Master Trice in Templar regalia was purchased by the lodge. Then, in July of 1874, Brother Davis donated a painting by L.A. Hagan of Joseph Speight to the lodge. The ceiling was raised in the lodge room and the portraits were put on display. Clearly, the brethren were gearing up to have a lodge room as impressive as its list of members. 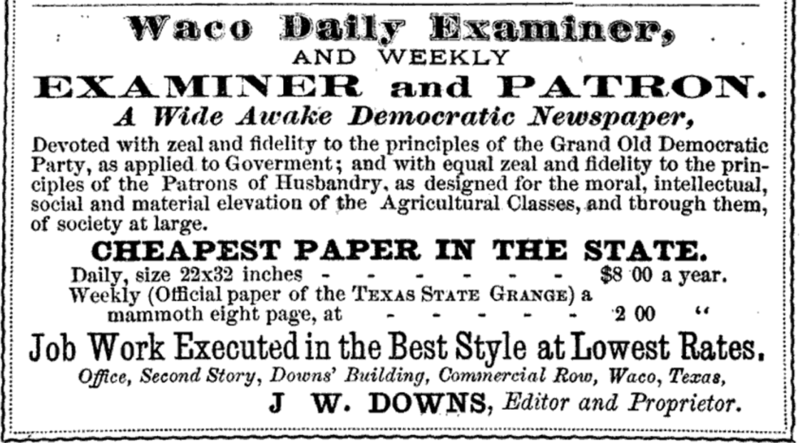 Then, on May 18, 1875, Waco Commandery No. 10 Knights Templar were meeting when a massive fire wiped out the entire Downs Building. Thankfully, our meeting records dating back to 1861 were saved but 1850-1860 were lost and so was our furniture and jewels. Also, the painting collection of our past masters was lost except for two: the Sion Trice painting(now in the 8th and Washington Masonic Temple) and the J.H. Gurley painting(now at the Lee Lockwood Library and Museum). The brethren had already been pooling their resources for the purpose of buying property elsewhere and building a new lodge but the fire threw a kink into their plans. While they figured out what to do, the lodge temporarily met in the nearby Oddfellows’ Hall and in Sam Houston Hall at Waco University(later merged with Baylor). The Waco Masonic Building Association arranged with Brother Downs to team up and rebuild the Downs Building. This time, it was erected primarily for the purpose of Masonic functions with the first and second floors still reserved for Downs and other businesses. Our Past Master Sion Trice did the brickwork and a few funny stories regarding his work on the building can be read on his biography page. 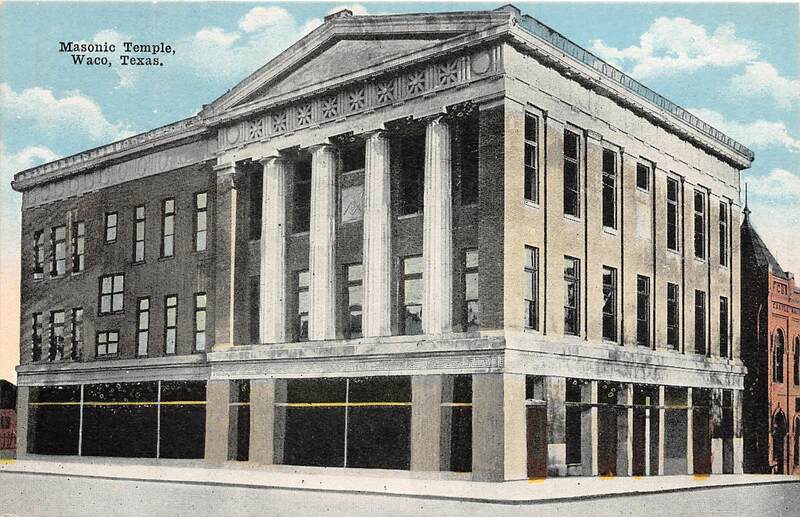 This new version of the Downs Building was more often referred to as the Waco Masonic Temple or Hall. To carpet the meeting hall, a ram was donated by a lodge member and raffled off. In September of 1878, Brother Trice made a $500 donation to rid the lodge of the remaining debt incurred by construction of the new Temple. By this time, it was widely said that Waco Masonic Lodge counted among its members the most distinguished group of any organization in the entire state. A look at our list makes that hard to dispute: past masters and otherwise notable members. The growth of the lodge went hand in hand with the growth of the city and in the photos below, one can see how much more developed the area around our Masonic Temple became. 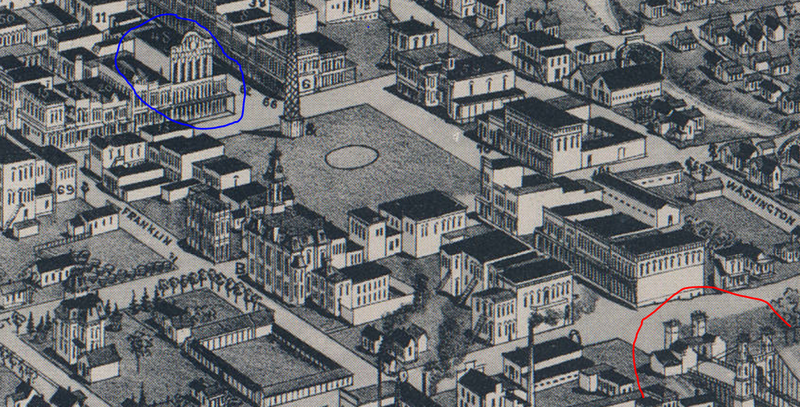 By 1900, the city was truly flourishing with the Masonic Temple at its center. 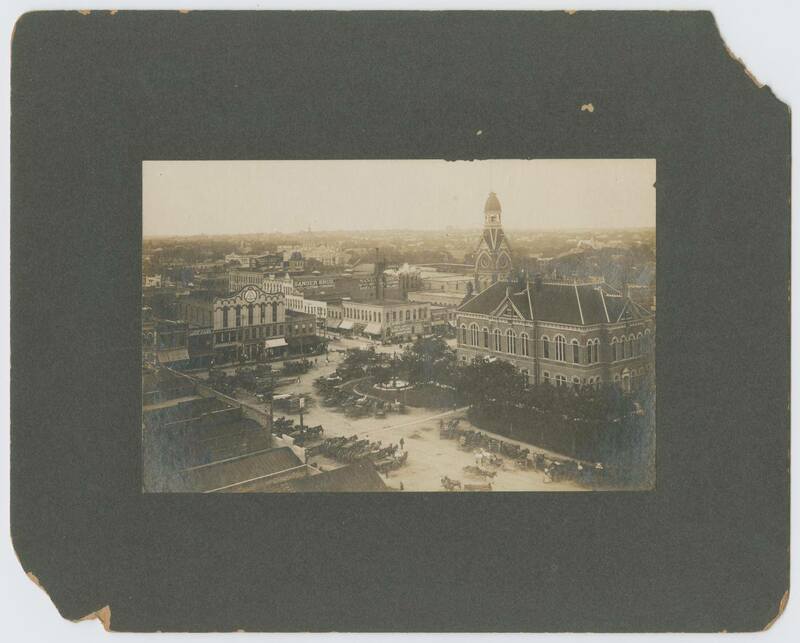 A new City Hall was designed by our own Brother W.C. Dodson, famed Texas courthouse architect, and it was built so that it looked down Austin Street. The photos above were likely taken from the City Hall steps. Our generous efforts in supplying the Grand Lodge with a new home did not guarantee good fortune for our own building. 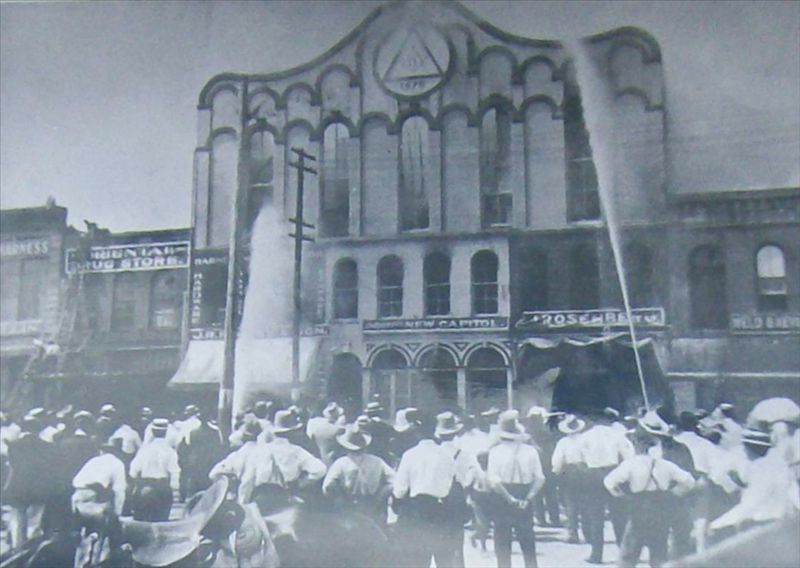 On July 18, 1909, the Downs Waco Masonic Temple burned again. This time, many of the townspeople ran down to watch and screams joined the sound of the fire on the night air. It was said that many people lost their voices for several days after. Brother Jim Meers led Fire Department efforts to save the building. Unfortunately, the third floor, which included our magnificent meeting area, was lost but the first two floors of the building survived. Our Lodge meeting records from the 1880s-1890s were lost and so were a number of other valuable items. Thankfully, the records from 1861 to 1880 were saved. Portions of the building remained intact and underwent renovations so that it could be used for other purposes. The Fox Theatre was housed in the building for a few decades. Tragedy again struck in May of 1953 when the infamous Waco Tornado tore a hole into the roof but it was repaired. By the 1960s, the “Mexico Theatre” was using the building until the entire area was virtually demolished for the Urban Renewal program. For a few years, we met in the Grand Lodge building we had supplied just a few years earlier. John Maxwell was Master of the lodge when the fire took our old Temple and he immediately set the brethren to work on a committee project to build a new one. On March 8, 1910, E.C. Street announced that the committee had purchased a location at the corner of 8th and Washington for $8,750. By this time, our membership exceeded 1,000. Brother Milton Scott submitted blueprints for Temple designs in the Neo-Classical Greek Revival style on March 12, 1912 and in December, the committee selected a bid from Fell & Ainsworth Construction to do the work. The members of the building committee made up the first officers of the newly formed Masonic Building Corporation of Waco which was created to build and maintain the new Temple. With the 1910s came Camp Macarthur in support of the country’s WWI efforts. Our lodge experienced an incredible growth spurt as thousands of soldiers wanted to become masons. As a result, many new lodges split off from us to accommodate the growing membership. A similar trend occurred during WWII. This meant that no less than fifteen masonic bodies existed in Waco by 1960 and a new problem arose. Often, it was impossible to hold a called meeting at 8th and Washington because masonic groups would have the meeting halls filled. On top of that, economic and social trends in Waco meant that downtown was looking more and more bleak. On December 4, 1968, a groundbreaking ceremony took place on Cobbs Drive with the intention of erecting a new Masonic Hall for Waco 92. We had purchased the site at a price of $16,125 for three acres of the old Rich Field air strip. In 1969, Waco 92 left the Masonic Temple at 8th and Washington and moved to its newly constructed building at 4324 Cobbs Drive which cost an estimated $150,000. 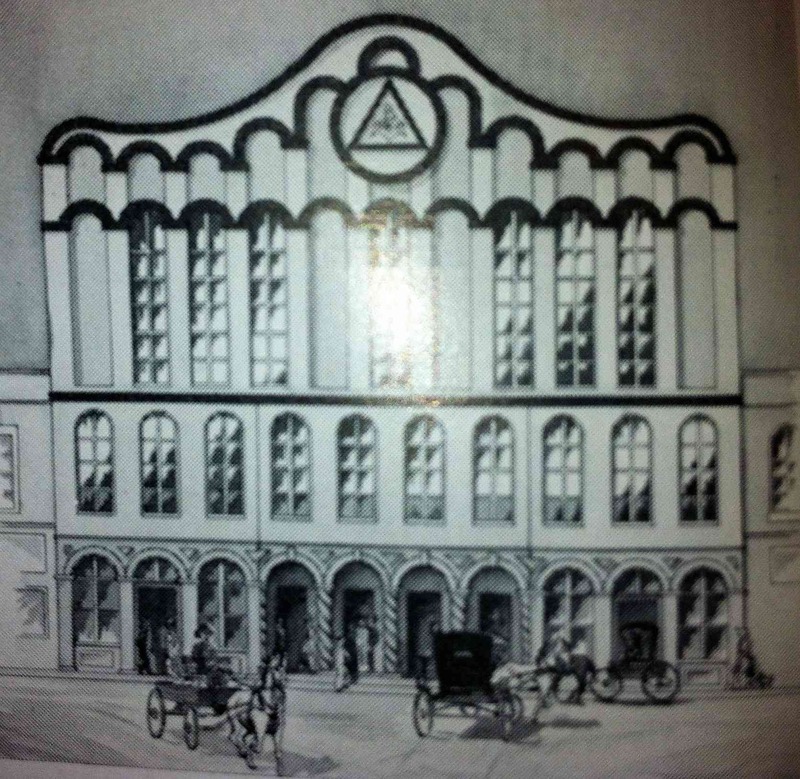 This building was eventually dubbed the William Quebe Temple in honor of our longtime secretary Brother Bill Quebe. In the northeast corner of our lodge room is the old 1875 cornerstone from the Downs Building and in our lobby, one can find many photos and artifacts from our several meeting places through the years.